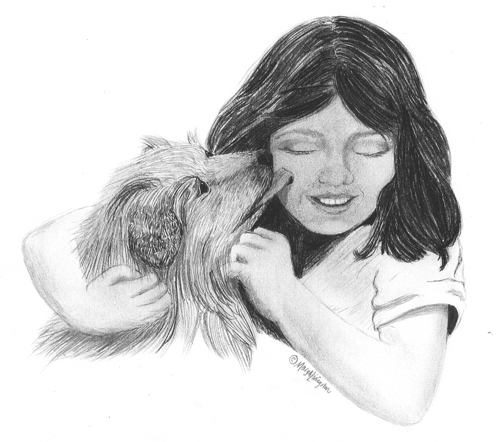 This entry was posted in Art, Child's perspective and tagged child and dog, Mary A Livingston, pencil, pets, Timeout for Art by MaryALivingston. Bookmark the permalink. Mary! What an amazing drawing! Words fail me! Your post came into my inbox, and I just sat and stared as I soaked in the beauty of this drawing! So glad you like it, wish I had more time today on it, but it has been crazy around here and I overdid it last weekend. Absolutely makes my eyes mist up when I see a drawing or a photograph depicting the love between a child and a dog. This is really an expressive drawing. Beautiful. Thanks. When I was a small child I had a little dog. We played together for hours. That is something that you will always remember. Such a great childhood for you. You always amaze me with your drawings full of emotion. Thanks for sharing. Incredible drawing…so full of life and emotion. It must have taken you forever to draw this. I am awed by your detail. Thanks, I am so glad you like it. It didn’t take very long, it is small. The original drawing is less than 6 inches wide. Funny how some things take a long time and others go so quickly. Indeed, furry friend kisses are wonderful. You can see and feel the bond there between the two of them in your drawing Mary . Just lovely really lovely . I am a dog fan, can’t you tell? You’ve really captured the emotion of the girl and the dog loving the moment! Beautiful drawing. Don’t know what I’d do without my fur friends! Indeed. There is a story that goes along with this one. Needs a lot of thought for delivery, as it does not end well. Perhaps not a picture book.